"We are holding the Dales Your Voice Your Choice event on 27th February 5.30 – 8.15pm at St Christopher’s Church Hall, Trent Road, Off Colwick Road. 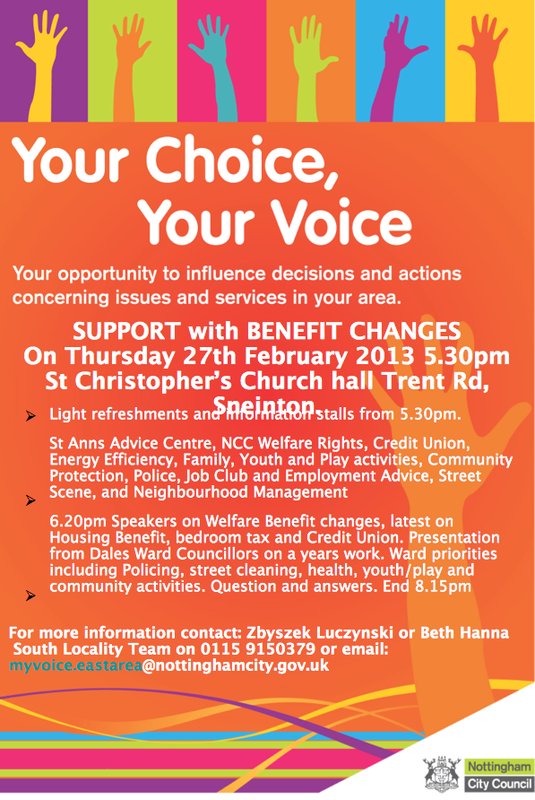 Publicity and information on Welfare rights sessions in Sneinton are attached. This is an annual event with a focus this year on what support/provision is available for residents in the Dales. We are having stalls that will cover Welfare Rights, food banks, Credit Union, Energy efficiency, employment/training/volunteering opportunities, Policing and Community Protection and youth and play activities and family support and community events and activities etc. Presentations will include the Councillors annual report, Police report and a presentation regarding Welfare rights reforms and local support available."